BATON ROUGE, LA– Nearly five years after the Deepwater Horizon disaster in the Gulf of Mexico, a legal watchdog group is calling into question who is benefiting most from the unprecedented class action settlement set up to compensate victims in the aftermath of the 2010 oil spill. 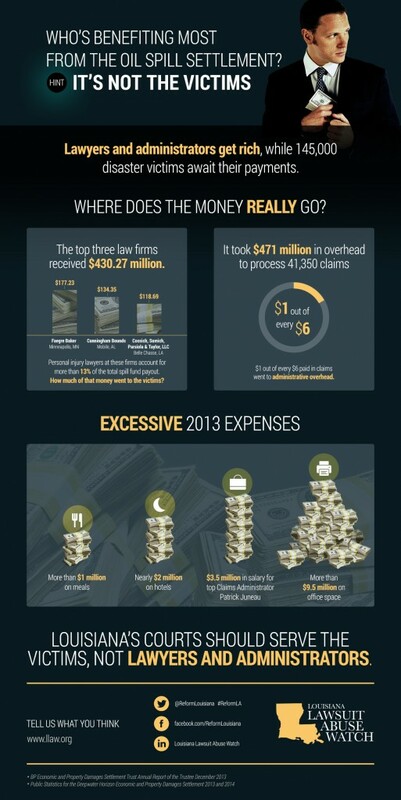 A new infographic published by LLAW illustrates some of the staggering administrative costs stemming from the settlement. “These outrageous administrative costs make it perfectly clear who is benefiting the most from the oil spill settlement—and it is not the victims,” Landry continued. Louisiana Lawsuit Abuse Watch (LLAW) is the state’s leading legal watchdog organization. Since it was formed in 2007, LLAW has grown to nearly 6,000 supporters across the state, representing small business owners, health care providers, retirees, taxpayers and workers and their families. Using community outreach, voter education and grassroots advocacy, LLAW works to raise awareness about the costs and consequences of lawsuit abuse and urge elected officials to bring more balance, fairness and common sense to Louisiana’s civil justice system. To learn more, visit www.LLAW.org.